Fluency is a dream that most Spanish learners want to achieve. Even if you don’t necessarily want to be mistaken for a native, the end goal is usually to be able to communicate efficiently and understand most of what you’re being told, what you read and what you watch. But when you reach that level, now what? 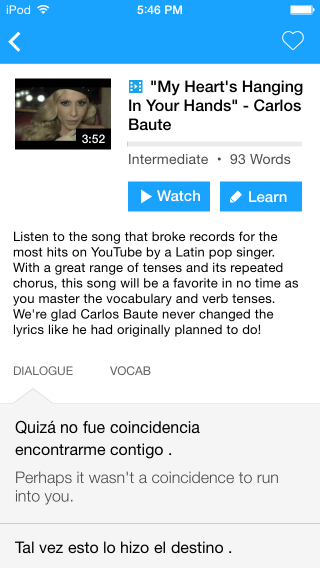 What if you want to push it even further and attain a more advanced Spanish level? If you choose to do this on your own, it’s not always easy to find good products for advanced Spanish learners. In fact, most of what you can find on the market is designed for beginners, upper-beginners and intermediates—but where’s all the good stuff for somebody who wants to go from intermediate to advanced or from advanced to fluent? If you’re in those latter categories, let us present you with a couple of good advanced Spanish textbook recommendations for you to take a mighty leap forward in your Spanish skills. 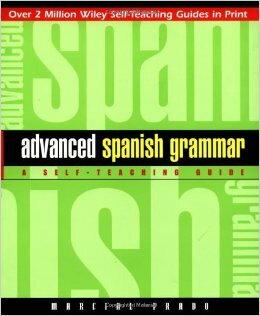 As the name implies, this very dense textbook teaches you the most intricate grammar use found in the Spanish language. You’ll find numerous exercises and tests throughout to make sure you understand everything that you study. Every lesson in this textbook is pretty complete, each presenting a list of new terms, sample dialogue and explanations of grammar among other things. 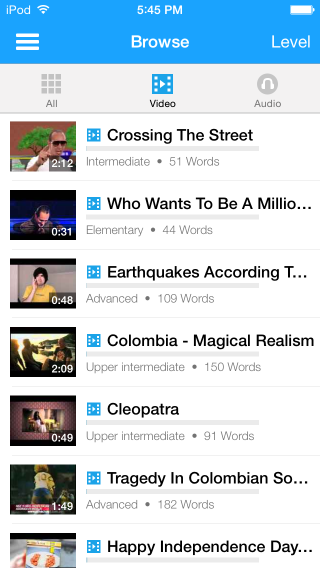 You’ll also learn lots of useful words, idioms and phraseology (over a 1000 of those are featured). This textbook/workbook combo is definitely one of the few great reference books for upper-intermediate and advanced Spanish students. Please note one more uniquely great thing about it: the book’s written almost entirely in Spanish! You’ll find very few English words in it. 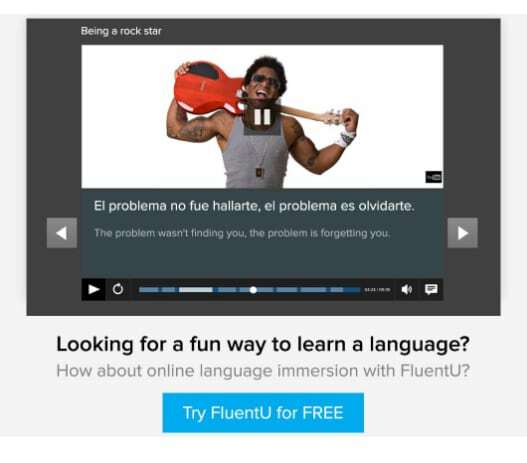 In this way, it creates a complete immersion experience and pushes you to learn and think in Spanish. The “Practice Makes Perfect” series is pretty well-known for presenting clear, concise, down-to-earth and practical books. You’ll be glad to find out that this advanced grammar textbook has those qualities and much more. The purpose of it is to take an upper-intermediate to advanced level estudiante (student) beyond the fundamental principles of Spanish grammar. It’ll help you to create meaningful and complex sentences in order to communicate more naturally. 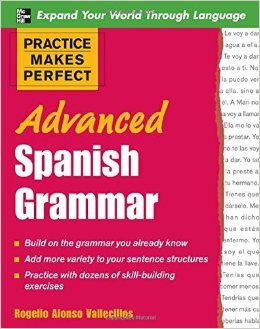 In addition, the book goes way beyond Spanish tenses as it features lessons and practical exercises on adjectives, adverbs, idiomatic constructions, reported speech and relative pronouns among other things. Note though that this libro (book) is pretty tough to master, so you might want to take your time and use it as a reference if you decide to invest in it. This book and the one below are both available on VitalSource, a convenient e-book resource to consider if you like your learning materials cheap and electronic. They have lots more Spanish learning material on offer, including books covering specialized subjects like slang and medical Spanish. This book is the one that follows the popular beginner “Easy Spanish Step-By-Step” book. This advanced volume is designed to give you the tools you need to reach advanced Spanish proficiency quickly. It starts off with a quick overview of key grammar basics to refresh your memory before going into a complete coverage of verb tenses. Then, you’ll be introduced to hundreds of new words reinforced with readings to put them into context. 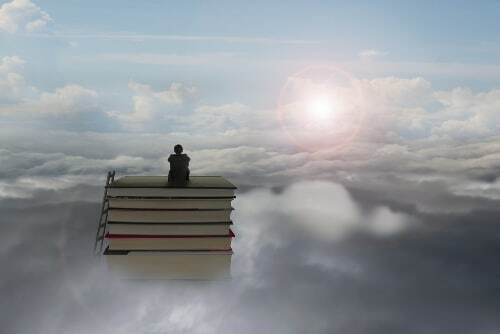 This is the ultimate method for absorbing new vocabulary, as the memorable context will help root words in your brain. This book is really easy to follow and it would be a good idea to read a couple of pages per day to practice your Spanish regularly. Although this version might be more suited for intermediate to upper-intermediate level students, the plus side is that the book can be read comfortably from front to cover. The advanced level student will most certainly find useful vocabulary and key concepts here that’ll be easy to assimilate into their working knowledge of Spanish. This product is much more than a book. It’s a complete multimedia Spanish learning program composed of 3 books (for beginner, intermediate and advanced learners) designed to be used in combination with 9 audio CDs (3 CDs for each level). The whole thing is pretty well organized with topic-based chapters featuring new words, sentence structures and conjugations along with clear, professional, high-quality audio recordings. The program does aim at teaching you conversational Spanish through a well-balanced combination of vocabulary, grammar, dialogues, questions and exercises in each section so you can speak as quickly as possible after starting your studies with it. If you’re looking for the advanced material, you might as well head straight to the advanced CDs and books to get right into the good stuff. By the way, this program is super cheap considering the large amount of material included—just sayin’! 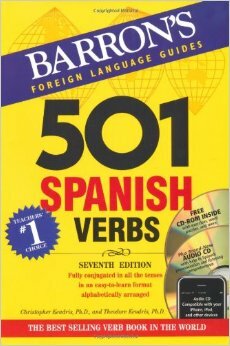 This 7th edition of the infamous Barron’s Spanish verb book shows you how to use the 501 most common and useful Spanish verbs in all 15 tenses and moods. Each verb is listed alphabetically (one verb per page) with its English translation, synonyms, antonyms and examples of usage. You’ll also find lots of exercises with answers to guide you along. This book is a wonderful resource for irregular verbs and keeping all the tenses straight. 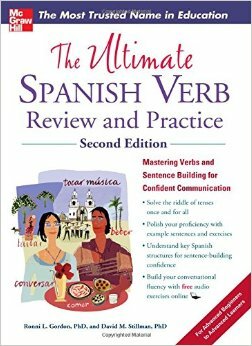 This is definitely one of the most comprehensive, most well-organized and most detailed Spanish verb reference books you’ll find on the market. 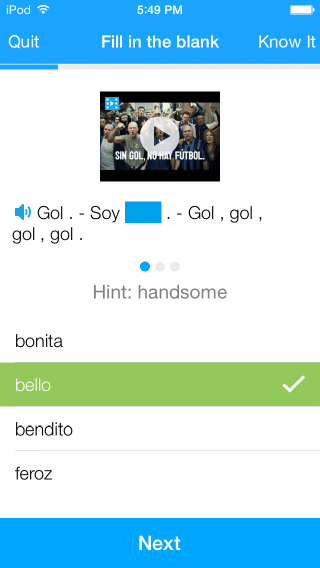 Let’s stay with the Spanish verb training for a little while. 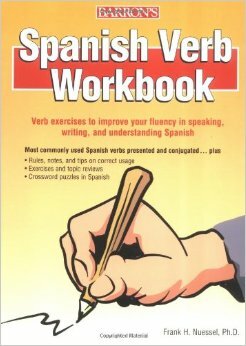 This workbook is what you’ll need to train yourself on the correct verb usages in español. Verbs are presented with fundamental conjugation information along with illustrative dialogues. 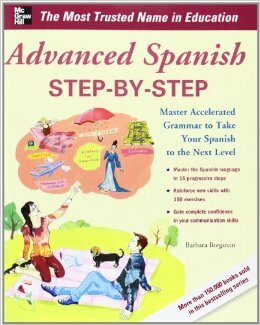 The book features exercises to help you master everything from basic tenses like present, present progressive or imperfect to more advanced forms like conditional perfect, imperfect subjunctive, present perfect subjunctive, pluperfect subjunctive, commands, passive voice, non-finite verb forms and much more! Whether you’re a beginner who wants to get his tenses right or an advanced student who wants to dive deeper into the language, this book should please you and help you achieve your goal. Have you ever heard of frequency dictionary? When I discovered what it was, it revolutionized my way of learning languages. Surprisingly, these special kinds of dictionaries aren’t always that popular. However, they’re tremendamente (tremendously) efficient in assisting learners as they strive to achieve mastery of the Spanish language. So what’s this book about? It’s an up-to-date frequency dictionary which provides a list of the 5,000 most commonly-used words in the idioma (language). Interestingly enough, the author used computer algorithms to process written material and transcripts of the spoken word to compile this list of the 5,000 most frequently-used Spanish words. Now, why’s it important to emphasize that it’s up-to-date? You don’t want to learn 19th century Spanish words and use them on your next trip in a Spanish-speaking country, do you? What sets this dictionary apart from older frequency dictionaries is that the majority of the processed texts were taken from the 1990s up until the 2000s, so modern relevancy and up-to-date usage frequency is assured. You’ll find that every entry comes with an English equivalent and a sample sentence. Note yet another very interesting feature: 30 thematically-organized lists of frequently-used words on a variety of topics (animals, weather, materials, family, etc.) that may not make it to the 5,000 most common words list. Those features make this dictionary a very handy reference to build one’s vocabulary up. You could, for example, give yourself the challenge to learn the 20 most common words of every thematic list or to learn the 50 most used words for every letter! 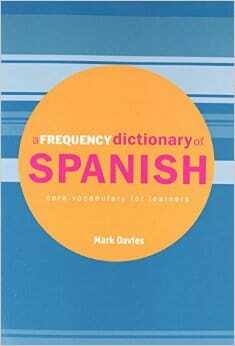 Anyway, this is another highly recommended advanced Spanish student reference book. How you decide to use it is up to you! This most excellent Spanish verb guide provides you with a concise review of the different verb forms along with extensive practice by using verbs in context. You’ll find a large variety of exercises like sentence completion, sentence building, dialogue writing, translation, verb-form replacement, etc. This uniquely thorough practice guide will be your best friend. It’ll help you get from using simple “subject + verb” sentences to more sophisticated phrases including conditional and compound tenses. It’ll be an excellent long-term investment that’ll help you get all the nuances you might not have understood so far. People usually say that when you learn a new language, the first thing you’re taught is less-than-appropriate words. That might be true, but one will have to work on many more formal aspects of a language in order to reach fluency. Slang and regional idioms are totally different, though. These are the kind of words and phrases which change tremendously from country-to-country and even city-to-city. They’re the kinds of things that you only really learn when you spend time with natives. Being able to drop some slang and local idioms when you speak is really important when you start to become a Spanish jedi! This special dictionary will help you achieve just that. It features close to 4,500 words seldom found in conventional dictionaries (you’ll understand why when you read it). 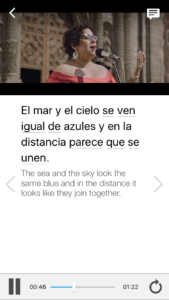 Each word comes with a Spanish definition, a sample phrase that uses the word in context and an English translation. 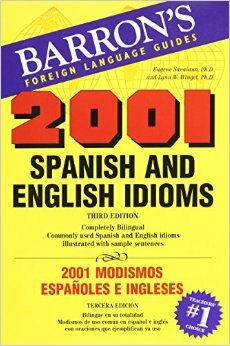 All in all, this dictionary will help you learn the most-used slang words and idioms from different regions of the Spanish-speaking world. 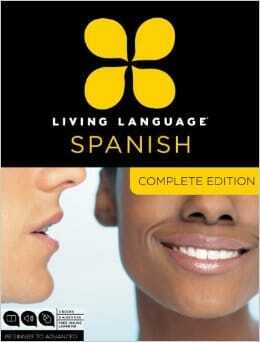 It’s ideally suited for an upper-intermediate or an advanced Spanish student. Apropósito (by the way), in case you weren’t already expecting this, the book features some pretty vulgar words. If you’re easily offended, you might want to pass on this one! As noted previously, things like Spanish idioms and lumfardo (slang) will seriously enrich your Spanish skills. This book, which focuses more specifically on idioms, is divided in two parts. One part is about Spanish idioms with their English equivalents. The second part features English idioms with their Spanish equivalents. With this neat organization, you can really improve your oral and writing skills by having the best of both worlds set before you. You’ll pick up on awesome Spanish expressions, and you’ll also learn how to turn your favorite English sayings into comprehensible and natural-sounding Spanish. As you can probably already tell, this book as a very useful resource for anyone who wants to sound more like a native Spanish speaker. By the way, be prepared for some good laughs when you find out the Spanish equivalent of some of our English expressions. Discovering that “the last straw” is translated into “eramos mucho y parió la abuela” (we already were a big group of people and then grandmother arrived) is priceless! 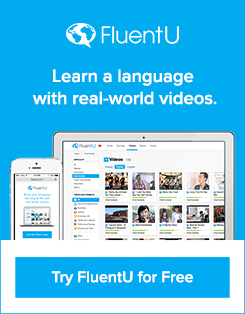 Oh, and if you love learning Spanish with resources focusing on slang, idioms and modern language use, then you’ll love FluentU. This pocket-sized dictionary is one the most useful (and cheapest) Spanish dictionaries for advanced students you’ll find on the market. With about 36,000 entries, 110,000 synonyms and 18,000 antonyms, this diccionario (dictionary) is an absolutely wonderful resource for any writing or translation work you may need to get done. 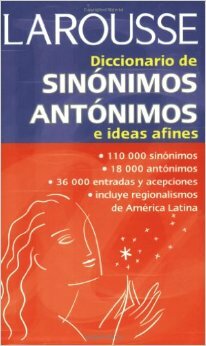 The presence of sinónimos (synonyms) and antónimos (antonyms) is incredibly helpful for improving one’s vocabulary. Just by looking for one word, you may end up learning 3-5 more words that you didn’t know before. By the way, one more very cool feature that’s worth pointing out: it’s indicated when a specific word has a different meaning in other countries (in Latin America versus in Spanish, for example). This may be really handy if you’re writing a piece for a Spanish or Latin American audience in particular, so you’ll know which words to use and, above all, which words not to use. So, there you go. Make your choice from this list of advanced Spanish textbooks and you can’t go wrong. Consider your current areas of focus when studying and your preferred learning style. What else stands between you and fluency? Figure out where the missing pieces lie, and complete the Spanish fluency puzzle with a great advanced Spanish textbook!